How Long Do Peas Take to Germinate? After a long winter, many gardeners are itching to get their hands into the dirt and get busy with the task of planting the coming summer's garden. One of the first tasks for spring gardeners is to prepare the garden for early spring planting and to choose vegetables that can be planted right away. Green peas thrive in cool temperatures, so gardeners can plant pea seeds as soon as the garden soil warms slightly and is ready to work. Prepare the planting area when the soil is above 45 degrees Fahrenheit and has dried sufficiently to allow you to work it. Add compost to the soil to help it drain more efficiently, if necessary. Make a plan for planting. Create double rows that are 8 inches apart and space the double rows between 18 and 24 inches apart. 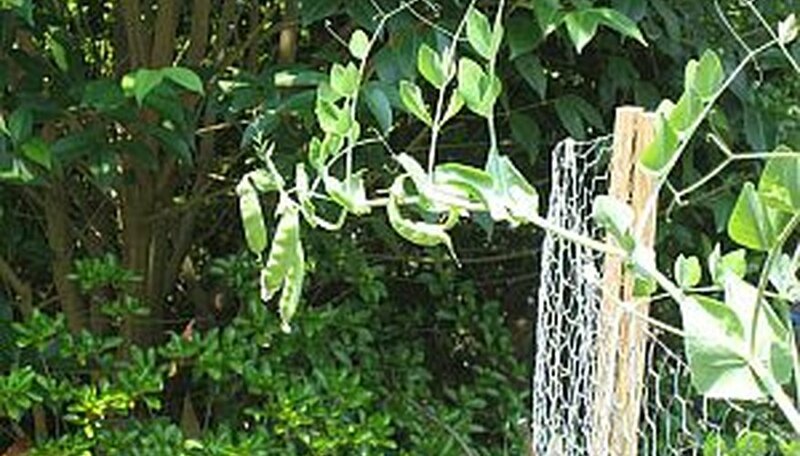 Erect a fence or trellis going down the center of the entire length of the double rows for the peas to climb. For best results, drive the fence or trellis posts at least 12 inches into the ground. Plant the pea seeds 1.5 inches deep and 1 inch apart in the double rows. Cover the seeds with a light layer of soil. Water the seeds and keep them evenly moist during the germination process. Watch for pea seedlings to emerge from the ground in approximately 2 weeks. Select a plastic container that will hold water. It is best if the container is wide enough at the opening that you can reach inside and pull out individual seeds. In this way, the same container is utilized for soaking and planting. Place the pea seeds inside the container. Cover the seeds with water. Soak the seeds from 12 hours to 24 hours prior to planting. Pour the water from the seeds. Discard any exterior husks that have fallen from the pea seed. Typically the husks will be floating on the surface of the water, and are easily poured or rinsed from the container. You will see that the pea seed has expanded, and some of the pods may have split open slightly. Dust the moist pea seeds with a bacterial inoculant. The bacterial inoculant will increase the germination rates of the pea seeds. Plant the seeds immediately. Do not allow the seeds to dry out after soaking. Sweet peas were first cultivated in the 17th century by Henry Eckford, a member of the Royal Horticultural Society. The blooms were all the rage of the late Victorian era. Sweet peas are prized for their variety of colorful, fragrant blooms. They are best used in sunny beds and borders, but can adapt to almost any garden style. Sweet pea growth varies depending on the type. Dwarf varieties grow 8 to 20 inches while climbing vines grow 6 to 9 feet tall. Sweet pea seeds do best when sown directly into the garden and spaced 6 inches apart. Deadheading old flowers encourages continuous blooming all season long. At the end of the growing season, spent blooms will self-seed for the following year. Seeds of the sweet pea are poisonous. If ingested, a disease called odoratism can develop. The symptoms mimic those of scurvy. 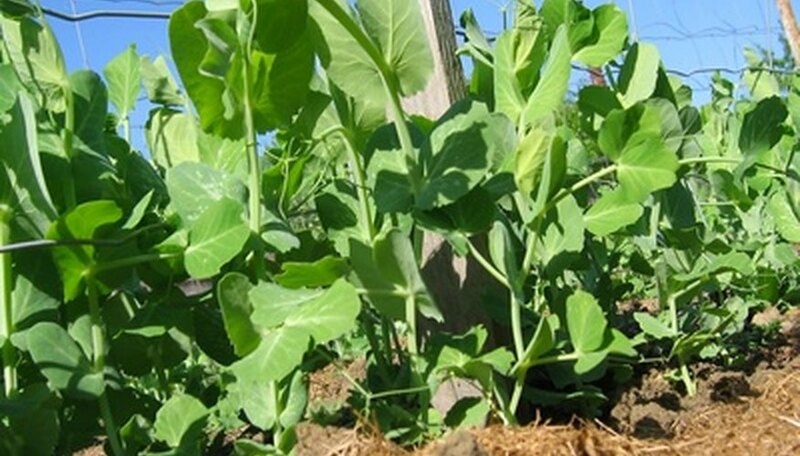 Pea plants require regular watering in well-draining soil. Do not allow the ground to dry out but don't over-water, as too much water causes root rot. Dr. T. C. Singh, of Annamalia University in India, demonstrated that plants grew twice as fast if classical music was playing nearby, as Michael Olpin of Weber State University explained, using the "Secret Power of Music" by David Tame. Dr Singh's experiments also showed that violin music specifically helped pea plants develop more quickly and with better health. Rub each seed between two pieces of medium-grade sandpaper for a few seconds to scrape, or scarify, the seed coat to allow moisture to enter the seed. Wet two paper towels thoroughly to dampen them throughout and spread the paper towels out flat one on top of the other. Set your scarified seeds on one half of the paper towel. Try not to let the seeds touch but get them close enough that they all fit. Fold the paper towel over the seeds. Slip the paper towel into a plastic bag, being careful not to dump out seeds. Seal the bag and set it in a cabinet overnight where it won’t be disturbed. Remove the seeds and plant them into soil outside. Sweet peas prefer being planted 1 inch deep and 3 inches apart. Place the pea seeds in a container and soak them overnight in water. Dig up the gardening bed to a depth of 5 inches. Use the gardening fork to loosen the soil. Add a 2-inch layer of compost and a handful of bonemeal to the soil. Rake it in to a depth of 3 inches. Level the bed with the rake. Plant the pea seeds 1-inch deep and 1-inch apart in north-to-south rows. 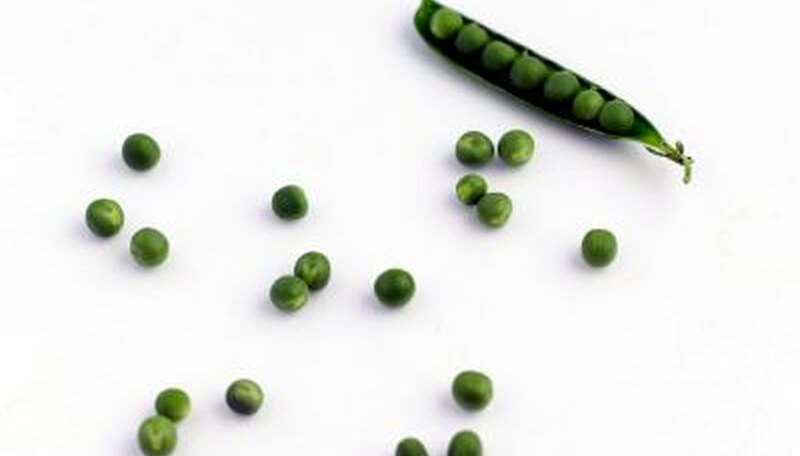 If planting more than one row of peas, space the rows 18-inches apart. Water the pea garden with the fine mist setting on the hose. Keep the soil moist, not soggy while the seeds germinate, generally within 10 to 15 days. Insert your finger into the soil, 2 to 3 inches below its surface. Do not water until the top 2 inches of the soil are dry. Use a watering can or hose to give your peas 1 to 2 inches of water when the soil is dry (approximately once weekly). Check the soil's moisture levels more frequently when the pea plant is producing flowers or pods. Its water needs increase significantly during this time. Although specific timing of flowering varies by species, brooms in both the Genista and Cytisus plant genera flower mainly late spring to early summer. Some species, such as Cytisus spachianus, blossom in late winter to early spring. Genista aetnensis blooms in mid- to late summer. Broom shrubs produce their flowers on branches that grew last year and the current year. If you must prune, do it in late winter before the new spring growth begins. One exception to this rule is Scotch broom (Cytisus scoparius), which must only be pruned after flowering ends in very late spring. Ill-timed pruning can result in no flowering that year. Brooms do not tolerate heavy, severe pruning. Only lightly trim branch tips to better shape plants, or to remove dead branches. Never cut into lowest, old wood -- plants will not rejuvenate. Allow a few sweet pea blooms to fade naturally on the vine. The blooms will fall off and be replaced by long, bright-green pods. Keep an eye on the sweet pea pods. As they dry, they will turn greenish-yellow. When the seeds inside are fully developed, the pods will be dry and pale brown in color. If you shake the pods, you can hear the seeds rattling inside. Remove the dry pods from the plant and put them on a tray. Put the tray in a cool, airy place to let the pods continue to dry for a few more days. Break the pods open with your fingertip, if they haven't already split, and the tiny, grayish-brown seeds will fall out. Put the sweet pea seeds in a regular white envelope, label the envelope, and put it in a cool, dry place until spring. Plant pea seeds in the early spring once the soil temperature has reached 45 F. Do not plant while the soil is wet and sticky; wait until the soil does not stick to your gardening tools. Keep the seedbed moist and do not allow the soil to dry out, since this stops germination. Gently pull up small invasive weeds as they appear so they do not form large roots and disturb the pea seeds. A soil temperature below 40 F delays the germination of the pea seeds. Soil temperature in the range of 40 to 75 F is ideal for germination. Pea seeds germinate in one to two weeks under ideal conditions. It may take up to a month for the seedlings to emerge if spring temperatures are low. Small pea sprouts resemble blades of grass when emerging from the soil and then develop two leaves before undergoing a growth spurt.